In part two of our Cambridgeshire geocaching road trip our main targets were the Digital Electronics caches (set by the same geocacher as The Cambridge Positioning System which I wrote about earlier). These caches come as a pair, firstly the Theory part and then the Practical. You need to solve the Theory puzzle first, then visit the cache to collect some equipment you will need to find the Practical one. So, Bob solved the theory puzzle easily but I found it much harder. Actually, I only solved it once Bob had given me a lesson in digital circuit design. Did I mention his electronics engineering background? Anyway, after a long session with paper circuit diagrams and coloured pens I finally obtained the coordinates. Last Wednesday we drove up to the location of the first cache. Once off the main roads, we found ourselves driving down narrower and narrower lanes until we finally found ourselves on a quiet, dead straight, lane. Eventually the tarmac petered out and we found ourselves on a byway which, as it turned out, was the only drivable one we found all day, but I digress. At GZ we soon located the cache. The cache was originally set up with 4 electronics kits for geocachers to borrow and we knew of one cacher who had a kit in his possession; we were relieved to find there was still one in there, I think we’d have been a bit upset if the box had been empty! Back into the Freelander and park in a nice quiet spot to conduct the circuit construction. I say ‘quiet spot’ but it was anything but. We were passed by a steady stream of dog walkers and horse riders. One of the horses was reluctant to pass us; her rider told us her horse was a bit spooked by our vehicle as “there isn’t usually a car parked there”. Bugger! Not the display we expected! Was the kit a “dud”? There had been some logs suggesting one of the kits didn’t work. Of course we’re made of sterner stuff and we weren’t giving up just yet! There then followed a session of pin straightening, wire wiggling and similar activities. Still nothing. We had a brew. Rechecked our wiring. Ah Ha! Made a small change. Bingo! Once we had it working we were able to obtain a set of coordinates. That wasn’t quite the end of it of course, we had to visit that location, obtain some more info and input that into our circuit-a-ma-bob to obtain the final coords. While we were looking for the intermediate location a couple of farming types drove up in a muddy 4×4 to enquire what we were doing. When we said “geocaching” they didn’t seem surprised and became more friendly; “I’ve seen lots of things in the vees of trees round here” said one. Friendly muggles! Anyway, back in the car and off to the final and an excellent find of an ammo can. Of course, we then had to return to the Theory cache and put the electronics kit back for the next cacher, which we did. These have been two of the best geocaches I’ve done to date, partly because of the work involved in solving the puzzles and partly in recognition of the amount of effort which has gone in to designing and constructing the caches. One of those occasions where awarding a favourite point doesn’t seem enough. After our success, we found a further couple of caches along what used to be a Roman road. One end of this was apparently a byway, so we had a gander to see whether we could drive it. Unfortunately the County Council had slapped a bunch of TROs along most of it and the only part we could drive had a 2 metre width restriction. It looked a bit narrow, so I edged the nose of the Freelander into the gap while Bob spotted for me. It looked very tight and after a short discussion we abandoned the idea, parked up and walked along the byway to the nearby cache. I’ve since checked the Freelander’s spec sheet. Turns out the width with mirrors retracted is 2005mm. No wonder it wouldn’t fit! It was good to see my moniker there from 2013. Plus, after logging our finds, we had a nice “H for Harry” shape on the map, made from smileys. So ended another brilliant day’s geocaching in Cambridgeshire! Just 10 finds, currently that’s a good day’s tally for me but this day was most definitely not about the numbers. 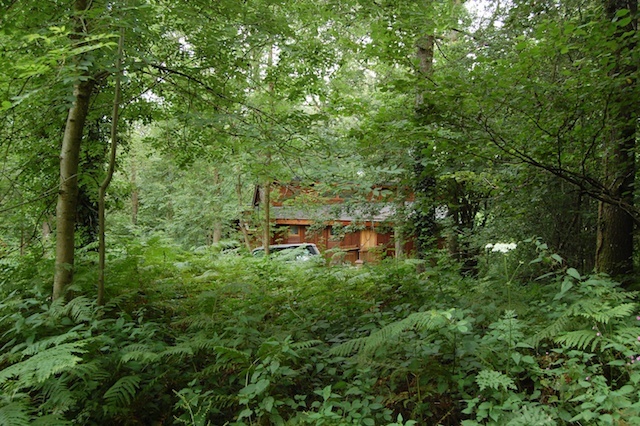 Anyway, the cabins are embedded in the forest, there is no external lighting so once it gets dark it’s, well, very dark. Plus there’s the absence of noise. Marvellous. This was the furthest we’ve driven with our dog. What can I say? She was brilliant and handled the journeys very well. I’m now confident we can take her pretty much anywhere. We had some great trips out, e.g. to Symonds Yat and Goodrich Castle. Oh, and I even managed a bit of Geocaching.